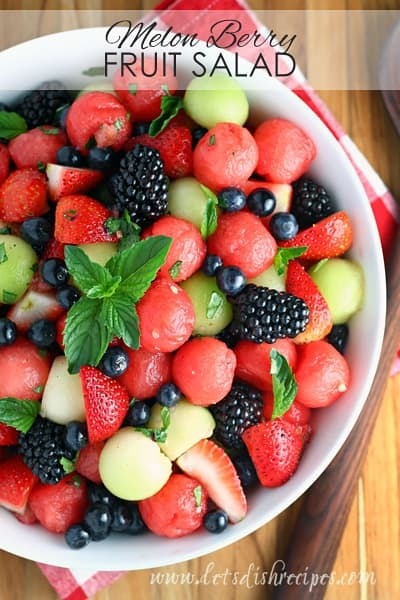 LAYERED SUMMER FRUIT SALAD WITH CREAMY LIME DRESSING — Fresh fruit is layered with a refreshing lime dressing in this beautiful salad that’s perfect for summer entertaining. 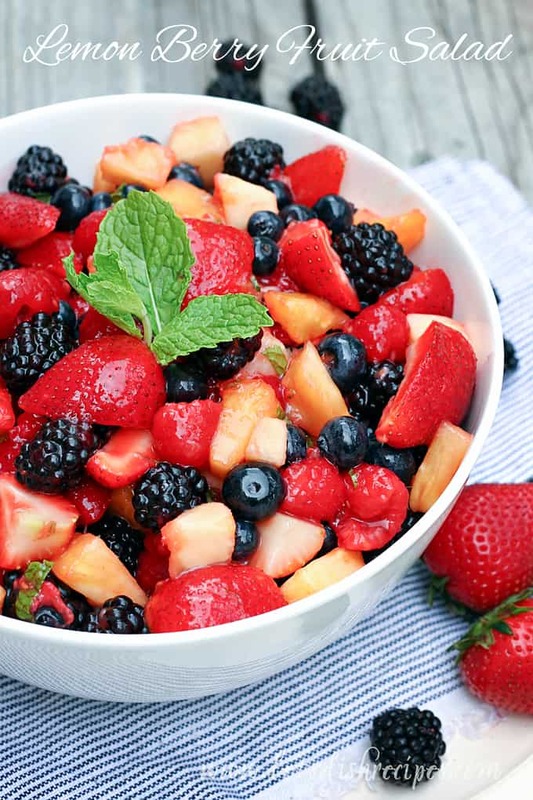 Nothing says summer to me like a colorful fruit salad. 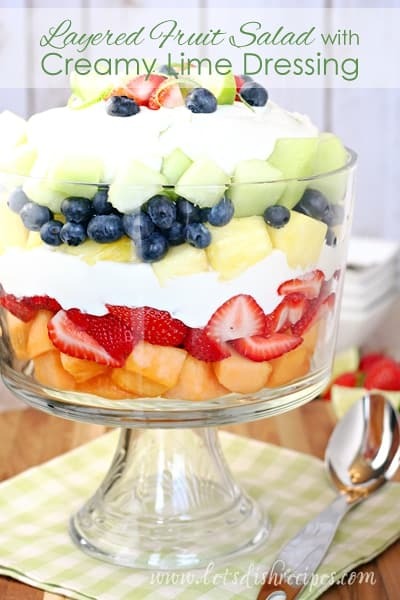 And when it comes to fruit salads, this Layered Summer Fruit Salad with Creamy Lime Dressing is a real showstopper! I served this at our July 4th barbecue and it was a huge hit! Not only does it look fabulous, it tastes fabulous as well. The creamy lime dressing really sets it apart from all the other fruit salads out there! In fact, the creamy lime dressing would also make an excellent fruit dip. So that’s definitely on my list of things to try. And the rainbow of colors in this layered salads will get you plenty of “oohs and ahs” from friends and family. A few tips when making this salad: first, make sure your fruit is thoroughly dried before assembling your salad. Once I’ve washed and/or cut my fruit, I like to lay it on some paper towels to dry. It also helps to assemble this salad just before serving. I like to get everything prepped ahead of time and then put the salad together just before guests arrive. Of course, once everyone digs it, it’s all going to end up mixed together. But until then, those pretty layers are going to get you lots of compliments. And yes, you can substitute different fruit if you’d like. I just try and stick with the general color theme. But the lime dressing is going to taste great with pretty much any fruit you use. 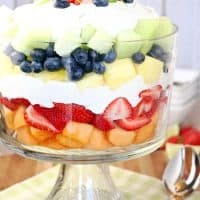 Whatever you do, be prepared for recipe requests when you serve this layered summer fruit salad! 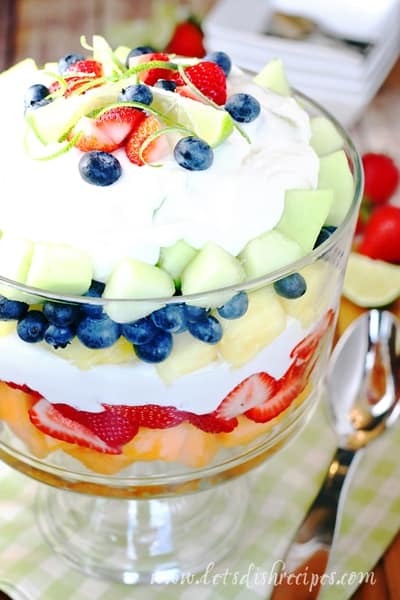 Be sure to save this recipe for Layered Summer Fruit Salad with Creamy Lime Dressing to your favorite Pinterest board for later. 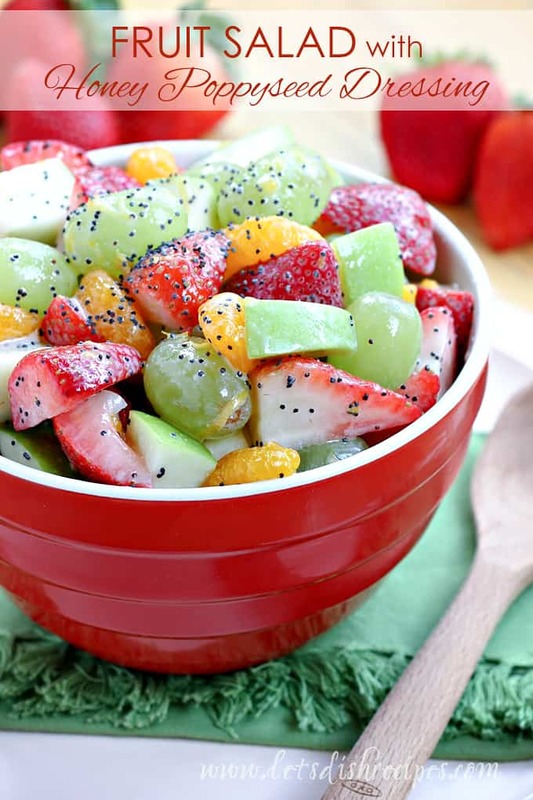 Fresh fruit and a creamy lime dressing come together in this layered summer fruit salad! First, make the creamy lime dressing by beating the cream cheese, limeade concentrate and sugar with an electric mixer until smooth. In a separate bowl, whip cream with an electric mixer until stiff peaks form. Fold whipped cream into cream cheese and lime mixture. Set aside. In a 3 quart trifle bowl, layer the cantaloupe and strawberries. Top with half of the creamy lime dressing. Next, layer the pineapple, blueberries and honeydew. Top with the remaining lime dressing. Serve immediately, or cover and refrigerate for up to an hour.